this raft race in Brixham, Devon was most entertaining. 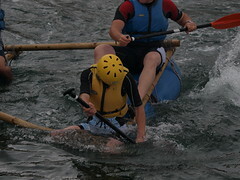 This particular raft was not well built but it had very strong members aboard and despite the fact that they were half submerged, they managed to finish the race. That is how my week has felt – submerged but, all being well, will finish strong!